The speed with which the new walls were built is a sign of the prosperity that reigned in Florence. The city had become the principal center of continental Tuscany, with a population that at this point must have been around 30,000 inhabitants, and which clearly showed signs of continued growth thanks to the arrival of immigrants from the countryside. This immigration from the contado, consisting prevalently of the more well-to-do classes, gave rise to a new middle class, an important factor in the tensions which accompanied the struggles between the nobles who held the power and all those others who were excluded, including the majority of commoners. In 1193 the tensions flared up and some of the important noble families (including the Uberti) which up to then had been kept at a distance from the consulate, backed by the favor of the emperor, took over the government. Basically the new ruling group was not unlike the old group, from a social point of view. The difference was mainly rappresented by the passage to a regime centered on a podestà, in which the executive power was entrusted to a single magistrate known as "Podestà". But with the death of Henry VI (1197), the families who had been ousted returned to favor and the consular system was reestablished. But not for long, for under the joint pressure of the social categories that were still excluded from power (shopkeepers, artisans), the regime of podestà was definitely installed in 1207, with the Podestà a foreigner (the first was Gualfredotto da Milano) so as to guarantee impartiality in the application of the law. The Podestà was flanked by a small council which replaced the Collegio dei Consoli, and by a Consiglio Generale, which included representatives of the merchants, so that the new system of government, which balanced the opposing tendencies of the noble ruling classes, was also accessible in part to the middle classes. The Commune thus experienced a period of peace during which the economic basis of the city continued to expand. The merchants, who had begun to organize in corporate association (the Arte dei Mercanti) in 1182, on the example of the Society of Knights, multiplied and spread well beyond the limits of their region. Around the turn of the century Florence thus became an international economic center, with its operators in the principal fairs of the West. The development of the economy went on at such a rate that in a few years the associations multiplied among the other categories of tradesmen and artisans, whose number increased considerably. The Arte dei Mercanti or Merchants' Guild in particular became more important. It began to be called Arte di Calimala, from the name of the stretch of street where the shops specialized in refinishing and dying the woolen cloths that had been imported in unfinished form from the other side of the Alps were located. These woolens were then resold in all the main markets of the West. The city still preserves some of the buildings which served as headquarters for the Guilds. 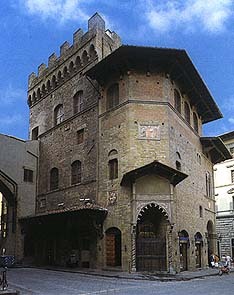 Generally they are buildings which date back to the 14th century, such as the headquarters of the Wool Guild (Arte della Lana), built in 1308 by restructuring an extant tower, and restored with integrations in style in the 19th century, or the residence of the Arte dei Beccai (Butchers' Guild), in the Via Orsanmichele. In various cases howeve the ancient seats of the Guilds were destroyed, especially with the demolition of the old city center: this is what happened for instance to the residence of the Arte dei Rigattieri e Linaioli and that of the Albergatori. The increase in size and population, due not to a natural increment but to the accellerated immigration from the countryside, lay at the basis of this economic expansion. The immigrants, members of a rural middle class that had been formed in consequence of the general economic development, settled in the city district which corresponded to the part of the contado from which they came. This was why the Oltrarno, on which the populous southern regions converged, increased enormously and this was why a new bridge in wood on stone piers (called Ponte alla Carraia) was constructed (1128) downstream from the extant bridge which then took the name of Vecchio. A few years later (1237) a third bridge was built upstream, taking its name from the Podestà in office at the time, Rubaconte da Mondello from Milan. This bridge, completely in stone, was set across the widest point of the Arno. Originally it consisted of as many as nine arches but two were closed in 1347 so as to enlarge the Piazza dei Mozzi. Later its name was changed to Ponte alle Grazie, after the small church which was built on one of its piers in the middle of the 14th century, and which was then flanked by various small shops and a number of small houses in which cloistered nuns lived. The pressing needs of trade and commerce between the cities, the result of the urban expansion, led to the construction in 1952 of still another bridge across the Arno: the Ponte a Santa Trinita. The four bridges served the city's needs up to the 19th century, although in 1317, the construction of a fifth bridge was begun in honor of King Robert of Naples and in expectation of further growth on the part of the city (which did not occur). The bridge, known as Ponte Reale and situated somewhat downstream from the present Ponte San Niccolò, was never finished and in 1532 Duke Alessandro de' Medici used its foundations for the erection of a fort on the Arno. With the exception of the Ponte alle Grazie, all the other bridges were destroyed in the disastrous flood of 1333. Even so, after their reconstruction, they maintained their typically medieval character with small buildings serving a variety of purposes erected on their structures. The concentration of population in Florence and the profound religious sense of its inhabitants obviously attracted the mendicant orders, the expression of the renewed 13th-century spirituality. The new religious orders (Franciscan, Dominican, Augustinian, Servite, Carmelite) played a leading role in the structuralization of the late medieval city. Since their apostolates required densely populated areas and large spaces where they could meet with the citizenry, they erected vast convent complexes and became poles of attraction which grew up side by side with the linear routes of the suburbs in organizing the activity and life of entire sectors of the urban area. The history of the architecture of the mendicant orders in Florence can be divided more or less into two periods. The first, from the origins up to the middle of the 13th century, witnessed the foundation of the communities and the construction of the first churches, all buildings of modest size as counselled for example by the Dominican Constitutions of 1240, cited almost integrally by the Franciscans: "Mediocres domos et humiles habeant fratres nostri...". Later, when the mendicant orders had acquired prestige within the 13th-century society, the increasingly intense activity in the field of preaching and religious instruction of the people necessitated enlarging the first small constructions. This was the beginning of the second period in Franciscan and Dominican architectural history, as well as that of all the other mendicant orders, which witnessed the ex-novo construction, often in grandiose form, of most of the original buildings. 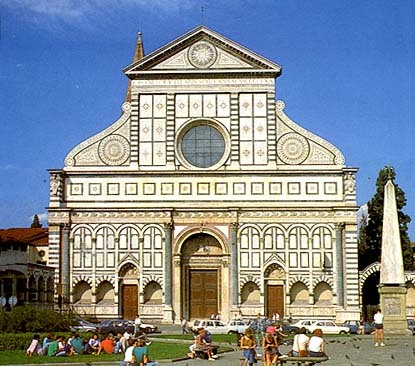 The Dominicans, who had established themselves in Florence in 1221 in the small church of Santa Maria delle Vigne, which had been donated by the cathedral chapter, enlarged the original heart of their monastery for the first time in 1246 and then in 1278 began the present structure. 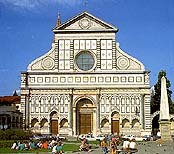 The first church of the Franciscans, dedicated to the Holy Cross (Santa Croce) dates to the second quarter of the 13th century. At the end of the century (1295) it was rebuilt as we see it today. And the same thing happened with the Agostinians of Santo Spirito, who established themselves in the heart of the Oltrarno in 1259 and a few years later (1296) enlarged their monastery; with the Carmelites of Santa Maria del Carmine; the Servites of the Santissima Annunziata, a mendicant order which originated in Florence. Even in the diversity of their formal solutions, the religious structures of the new orders were all characterized by the grandness of their buildings, due in part to the religious requirements (the need for large spaces to house the faithful and instruct them with the Word, and with the frescoed images on the large well-lit walls) and in part to the fact that the churches were considered real public buildings, built by the people and for the people "ad utilitatem animarum et decorum civitatis expedit". In addition to restructuring the precedent churches, the new religious organism created vast convent complexes, full of cloisters and rooms for study and work; they organized the communitarian life of the urban population, playing a role in political and cultural as well as religious life. 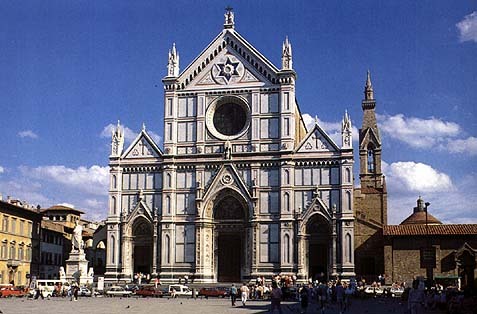 Together with the new cathedral of Santa Maria del Fiore, whose construction began in 1294, the large churches erected by the mendicant orders in the last decades of the 13th century (S.Maria Novella, S.Croce for example) constituted the principal examples of Gothic religious architecture in Florence. The new forms, imported into Italy by the Cistercians (who had built the Badia a Settimo, at the gates of the city, in the first half of the 13th century), fused on the Arno with the classicizing taste and geometric twocolor decoration which characterizes the tradition of Florentine architecture. The result was an original interpretation of the Gothic, in which the accentuated asending movement of the churches north of the Alps was moderated in a more measured and perfectly finished concept of space.